The wait is finally over! Kpreps is pleased to usher in the 2016 Kansas high school football season with the release of our Kpreps.com Top 5 rankings. There are several great story lines each season, and 2016 is no different. KSHSAA will unveil a new playoff format for Class 6A and 5A this season, while several teams that reached the final weekend last season will now compete in different classifications this fall. In fact, five of the 16 teams that played in a 2015 state championship game have switched classifications. So let’s get started! 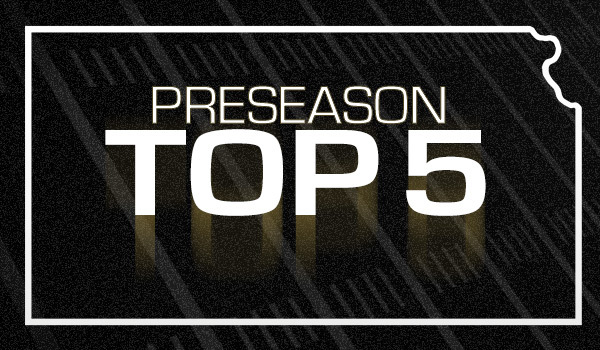 Take a look at our preseason rankings and let the debates begin! The annual disclaimer: our Kpreps rankings are a collaborative effort from multiple media sources across the state and will be released each Monday throughout the season. Defending champion Derby opens the season as the top team in Class 6A. The Panthers return 12 total starters from last season’s title team, but must replace all-state quarterback Brady Rust who rushed for 309 yards in the title game. Dan Dawdy will lead the Panther offense this season, and has two standout receivers in Kenyon Taber and Kai Lemons to help ease his transition. Shawnee Mission East begins the poll ranked second. The Lancers are 33-4 under Dustin Delaney and third 6A title game in four years seems like an attainable goal. East returns 16 total starters including Luke Kaiser who will be back to guide the flexbone. Joining the Lancer backfield will be speedy running back Nigil Houston who came over from Shawnee Mission West after a 600-yard, 8-touchdown season. Blue Valley opens as the No. 3 team after a state runner-up finish in 2015. The Tigers return six starters on offense including emerging running back Williams Evans and all-state offensive lineman Kirrian Kirby. The Blue Valley defense only returns two starters, but leading tackler Michael Maffry is a good piece to build around. Junction City checks in at No. 4 in the preseason poll after a 10-1 season a year ago. The Bluejays return nine offensive starters and eight on defense. The backfield graduated 1,800-yard rusher Raye Wilson, but returns the speedy Jovon Baldwin who rushed for more than 700 yards a season ago. The aforementioned Shawnee Mission West Vikings round out the 6A poll at No. 5 to start the season despite the loss of Houston. Fifteen total starters return for Tim Callaghan’s group including one of the state’s top receivers in Isreal Watson. The Vikings once again open the season at Lawrence Free State, a team that sits just outside the top 5. SM West won at Free State 34-26 to begin the 2015 season. While it’s a new season, traditional contenders Bishop Carroll and St. Thomas Aquinas start off atop the Class 5A poll. Bishop Carroll finished as state runners-up last season, but return the backfield duo of Adam Theis and Gage Gottschalk who hope to put up strong numbers again. Aquinas graduated virtually all of its offensive starters, but will look to rely on a solid nucleus of defensive starters in order to get through the brutal Eastern Kansas League schedule. Defending 5A champion Mill Valley begins the season at No. 3 with just three starters back on offense and two on defense. The Jaguars graduated several standout players including quarterback Logan Koch and do-everything Christian Jegen. While the starting experience may be thin, Joel Applebee’s team is still plenty talented as they look to adjust to life in the Eastern Kansas League for the first time. Mill Valley’s first game as 5A champs will be against No. 4 St. James Academy. The Thunder, also new members of the EKL, return six starters on each side of the ball from last year’s 9-2 season. Kansas State commit Sammy Wheeler will guide the offense at quarterback. Goddard-Eisenhower begins the year as the No. 5 team in Class 5A. The Tigers found themselves in the state semifinals after playoff wins over Kapaun Mt. Carmel and Maize South. Now “Ike” looks to expand on that 7-5 season with the help of 13 returning starters including quarterback Mason Madzey. Eisenhower opens the season at 6A No.1 Derby. Bishop Miege has dominated Class 4A-I en route to state titles in 2014 and 2015. Will this be the year the rest of the field catches up? If so, they’ll have to do so against a Stags team that returns 13 total starters and features standout junior quarterback Carter Putz, Missouri commit Jafar Armstrong at wideout, and Iowa commit Djimon Colbert in the defensive secondary. Second-ranked Andale makes the move to 4A-I this season after a 9-3 campaign last fall. The Indians return a solid backfield in quarterback Taylor Richter and 1,600-yard rusher Zach Meyer. Let’s stay in the Ark Valley Chisholm Trail League where four members are ranked in the top five. Buhler checks in at No. 3, but the Crusaders will have to find an answer to replacing quarterback Jace Williams and running back Dillon Engelland. Maize South drops down from Class 5A and begins the season ranked fourth, while McPherson rounds out the top five. Despite Andale’s move up to Division I, Class 4A-II may have gained the most strength in the new cycle with the addition of three programs that could contend for a championship. Traditional power Topeka Hayden drops down from Division I after a 10-2 season that ended with a loss to eventual runner-up Andover Central. The Wildcats return eight total starters, but must replace quarterback Dallas Crittenden who transferred to Lawrence Free State. Behind Hayden in the top spot is No. 2 Scott City. The Beavers have had a great run in 3A the past several years, but will now be under the direction of longtime defensive coordinator Jim Turner after Glenn O’Neil’s departure to Topeka Seaman. Scott City returns 14 total starters from last season’s 10-1 team. One spot behind the Beavers is the defending 4A-II champion Holcomb Longhorns. The Longhorns return 13 starters from a year ago, but must replace quarterback Trey Teeter who passed for more than 2,500 yards and 35 touchdowns. Holcomb and Scott City are Greater Western Athletic Conference rivals with Scott City winning last season’s match-up, 15-7. In fact, the Beavers have won 12 of the last 13 meetings against Holcomb. Wichita Collegiate is also new to 4A-II and the Spartans begin the year at No. 4 in the poll. Collegiate fell 20-19 to Rossville in the Class 3A title game and although a trio of all-state players graduated, Mike Gehrer believes that the pieces are there for another title run. Holton rounds out the 4A-II poll at No. 5, sneaking in just ahead of Frontenac in the voting. The Wildcats return an experienced group on the line that produced more than 4,100 rushing yards a season ago, but only Spencer Baum returns of Holton’s top five rushers. Plenty of questions surround the landscape of Class 3A football, but maybe none loom as large as how Rossville will replace Tucker Horak. Horak’s career has been well-documented and rightfully so, but the Bulldawgs must move on in order to try and win a third consecutive 3A title. Dawson Hammes rushed for more than 1,000 yards last fall and is Rossville’s leading tackler. Norton begins the season ranked second in the 3A poll. The Bluejays are extremely talented with quarterback Jace Ruder and lineman/linebacker Jacob Green. Even better, Norton returns an experienced offensive line that helped the Bluejays average more than 34 points per game. Tradition-rich Silver Lake starts the 2016 season ranked No. 3 after a second-round playoff loss to Sabetha. The Eagles return 12 total starters including quarterback Dalton Dultmeier who is poised for another big season. Hoisington checks in at No. 4 in the rankings. The Cardinals return all-state running back Hunter Hanzlick after his 1,949-yard junior season among 12 other starters. Rounding out the 3A top five is the defending 2-1A state champion Phillipsburg Panthers. The Panthers move back up to their typical classification and return 13 starters from last year’s title run, including backfield brothers Kirk and Mark Coomes. With Phillipsburg gone to Class 3A, last season’s state runner-up Troy begins 2016 as the state’s top-ranked team. The Trojans fell 30-29 to Phillipsburg in the title game last fall, and are hungry to get back. Derek Jasper’s group returns 14 total starters including 2-1A all-state selections Reid Greaser, Cuttar Huss, and Wil Smith. Second-ranked Smith Center appears poised for another strong postseason run. The Redmen return nine starters on each side of the ball from a 10-2 season where both losses came to state champion Phillipsburg. Another traditional 2-1A power, St. Mary’s Colgan, comes in a No. 3 to begin the year. The Panthers spent the past four season in Class 3A where they reached the state quarterfinals each year, including a 42-32 at Rossville in 2015. Colgan’s next victory will be the 600th in school history (599-143-8). The Meade Buffaloes begin the year ranked fourth after spending much of 2015 atop the 2A poll. Meade finished 10-1 with a 26-21 loss to eventual champion Phillipsburg. The Buffs return all-state quarterback Lawson Luetters who passed and rushed for more than 1,200 yards with 37 combined touchdowns last season. Finally, Lyndon rounds out the 2-1A poll with a group of 15 returning starters. Dexton Swinehart put up nearly 1,700 yards of total offense and registered 109 tackles for the Tigers a year ago. He returns along with backfield mates Rylan Burns and Mason Slusher and four offensive linemen. Spearville dominated the 8-Man, Division I field last season by finishing 13-0 and winning the state title with a 62-16 thrashing of Hanover. The Royal Lancers graduated several key players from that team, but return five starters on offense and three on defense. But Spearville opens the season ranked No. 2 in our poll. Instead, the St. Francis Indians get the bullseye of being No. 1. The Indians reached the state quarterfinals a season ago before falling 34-26 to Solomon. St. Francis returns seven starters on offense including all-state back Taylor Rogers, and six more starters on defense. In Rodney Yates second season as coach, he has the Indians looking for their first ever state title. Likewise, Burlingame appears to be a program on the rise under Jeff Slater. The Bearcats reached the state semifinals a season ago before falling to Hanover. Burlingame lost some talented players, including Shrine Bowl selection Paul Holt, but the Bearcats return nine total starters including quarterback Dalton Sporing and a solid group up front. Veteran coach Jeff Hostetter has the Rural Vista Heat in the preseason rankings at No. 4. The longtime Hope coach will have his best team since the co-op of Hope and White City three years ago. Rounding out the top five is the Osborne Bulldogs. Cullen Riner has reassumed the head coaching position at Osborne and has an experienced team featuring eight starters on each side of the ball. Cullen Grabast returns in the backfield after rushing for more than 1,000 yards in each of the past two seasons. There will be a new champion in 8-Man, Division II this fall as two-time defending champion Victoria has moved up to Division I. After finishing as the Division I runners-up a season ago, the Hanover Wildcats move down and assume the favorite position in Division II. Hanover returns all-state quarterback Will Bruna who had a record-setting season in 2015. Bruna passed for 3,452 yards with 56 touchdowns and only four interceptions. His receiving group has mostly graduated, but four other key players return that help make Hanover the early-season favorite. Otis-Bison begins the season in the No. 2 spot. The Cougars posted eight wins last fall and have nine total starters back from that team. Quarterback Kade Urban and back Brad Lightfoot both return and will be helped by an experienced group up front. Third-ranked Pike Valley also returns a lot of experience. The Panthers, under longtime coach Don Melby, return 11 total starters including all-state running back Lane Peters. Entering his junior season, Peters has already rushed for nearly 2,400 yards. Traditional power Sharon Springs-Wallace County begins the season in the top five at No. 4. The Wildcats endured a difficult end to the 2015 season with the death of standout player Luke Schemm. Wallace County hasn’t lost a regular season game since 2011, but travel to 8M-I top-ranked St. Francis to open the season. Finally, Hodgeman County rounds out the top five in 8-Man II. The Longhorns are down from Division I for the first time and return five starters back on both sides of the ball.